First time blooms on my favorite plants for April. I've been in various stages of the flu for about two weeks now. Got the flu shot, not a covered strain. I'm recovering slowly now and when I do get a chance to go outside I've been surprised at how amazing everything in the garden looks. 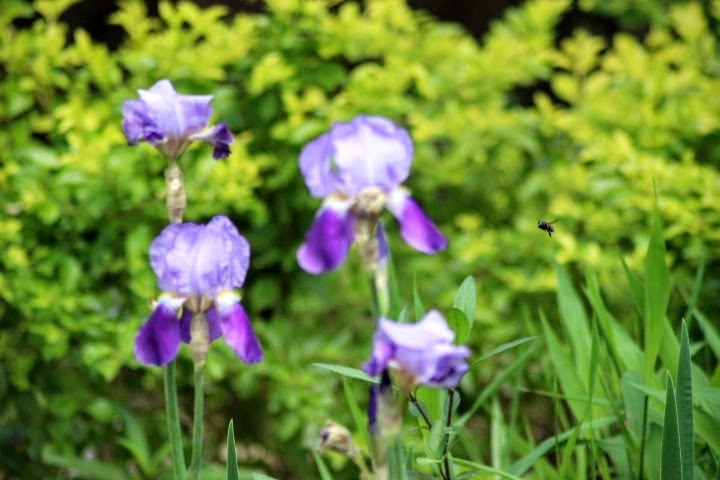 The biggest surprise are blooms on plants that rarely bloom or have not bloomed before. On the last Friday of each month Lori at Danger Garden posts her favorite plants and asks garden bloggers to do the same. 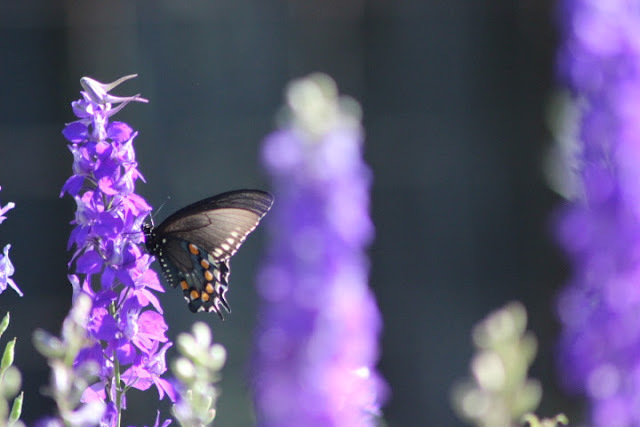 Since these rare (for my garden) blooms caught my eye this week I'm putting them together for my favorite plants for April. When I posted about my great yucca quest, I mentioned my friend Linda volunteered to drive 150 miles round trip to Austin to pick up two large yuccas in her truck. I asked Linda if I could post on her garden and she agreed! 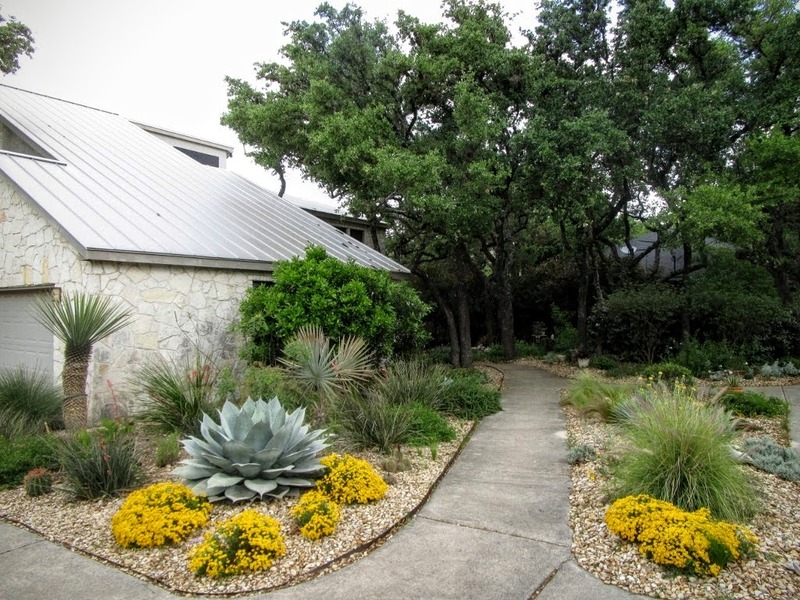 A native of upstate New York where water is plentiful, Linda has embraced the San Antonio style of watersaving gardening since moving here in 2007. Linda and her husband Alan purchased their new home in north central San Antonio in 2007 and started with a blank slate. 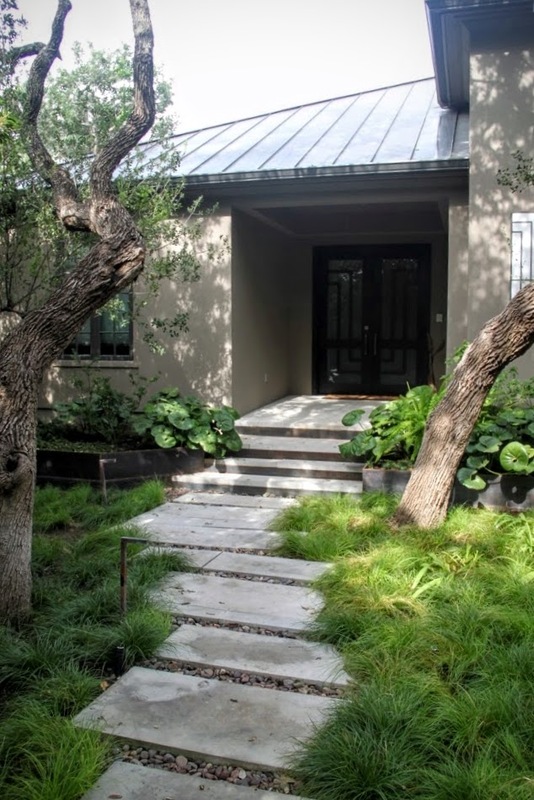 I think it's interesting to see how no-lawn gardening works in their newer development with smaller lots. Linda is a garden designer who has written several articles on gardening with native plants. 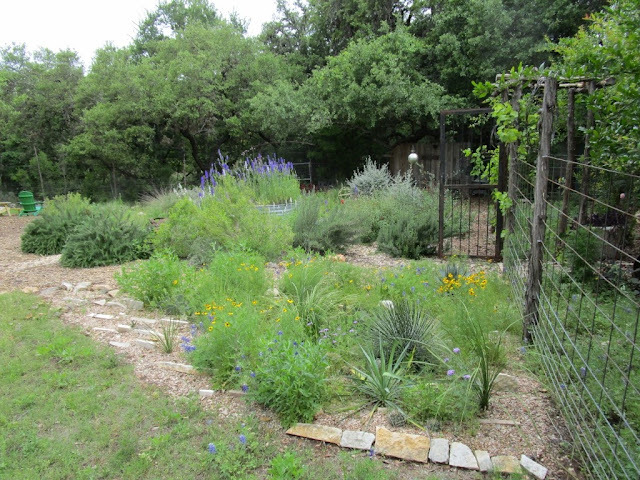 The current Spring 2016 issue of the Native Plant Society of Texas magazine News includes her article on interesting Texas native plants not commonly sold in nurseries. 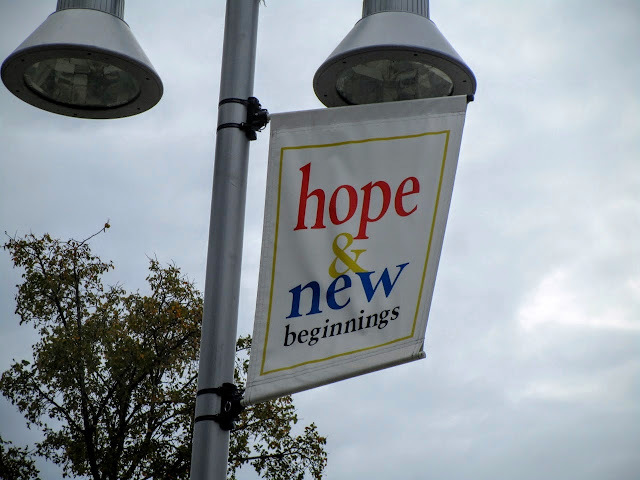 One of the biggest challenges in writing any blog post is what to leave out and, as usual, I decided to include as much as I could fit in. 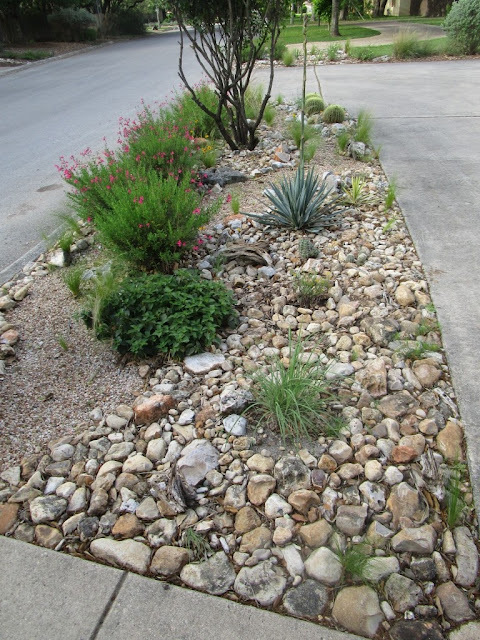 We'll begin at the sidewalk with a sweep of raised-bed gardens filled with colorful native and adapted plants. 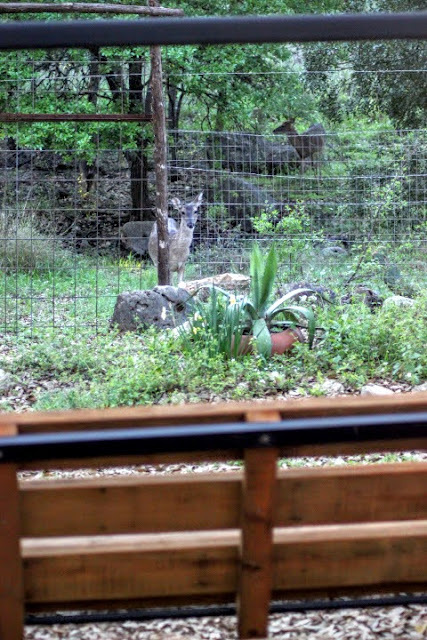 No deer problem means she can plant roses in the front yard. 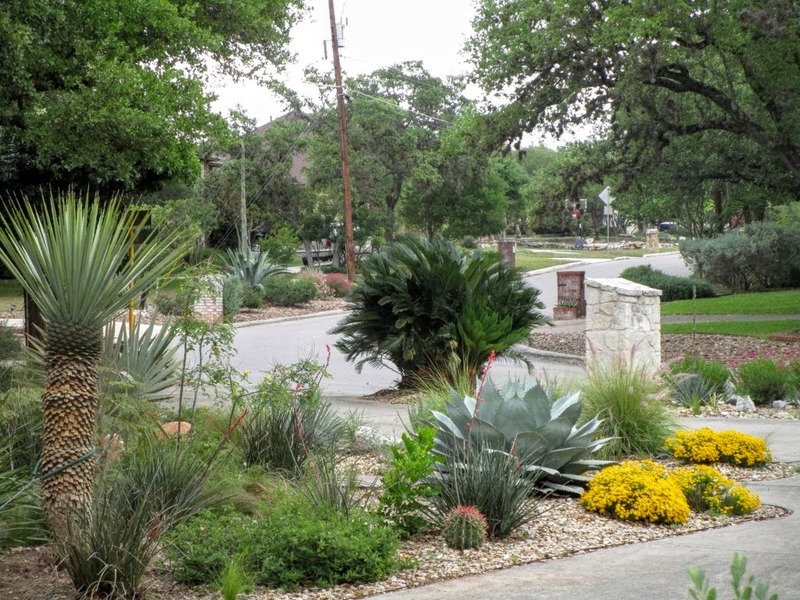 This past Saturday I volunteered at our local Watersaver Landscape Tour. The gardens were exceptional and we had a great crowd. I'll show you my view of the tour in future posts but first I like to tour my own gardens at the same time to see how it would go. The landscape tour, usually held in October, was moved to April this year due to weather. It's been a while since I took you on a walk around my own gardens, so let's see what visitors would see if they toured my garden over the weekend. 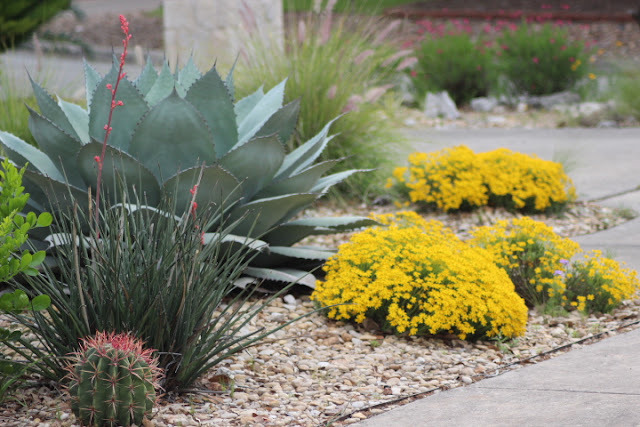 Bright yellow Damianita makes for a cheery welcome at the front walk. 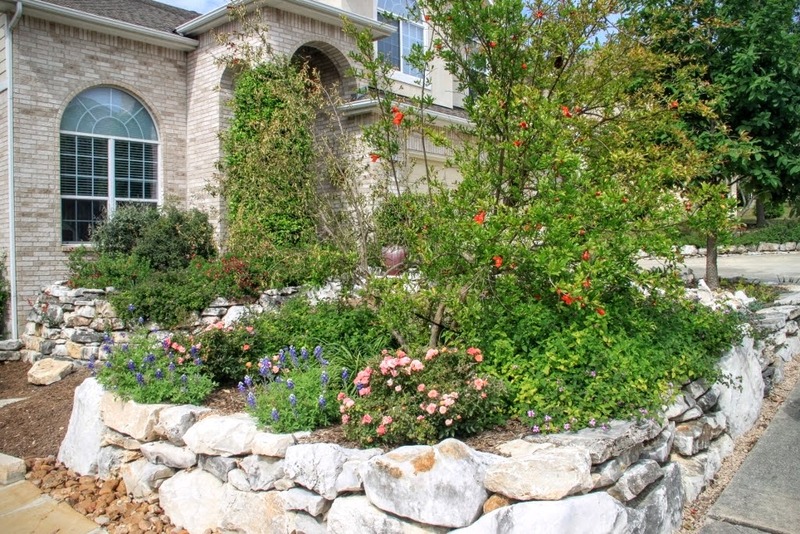 Damianta blooms like this several times a year and is evergreen which is why we replaced 'New Gold' Lantana which fell short in both departments. My new Yucca rigida is settling in nicely. 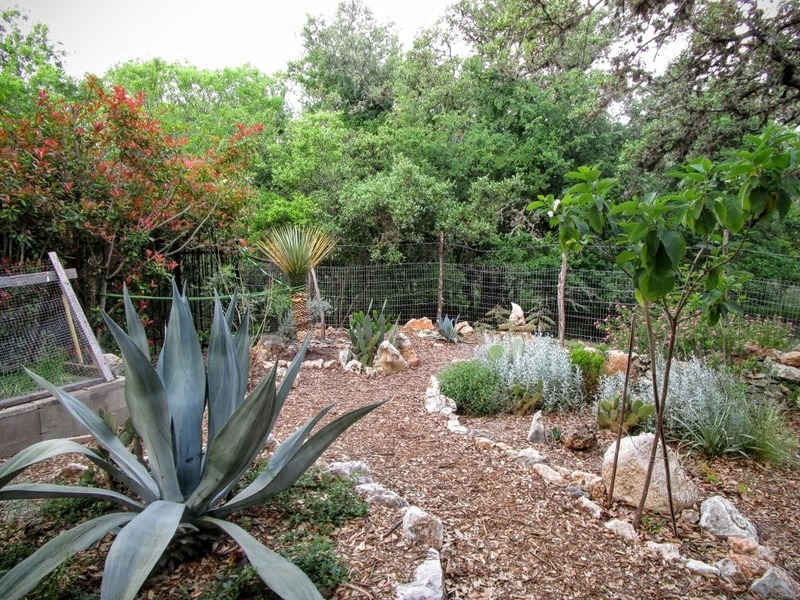 I'm adjusting my usual tour pattern and starting with the star of my front garden today in honor of Moby, Pam Penick's Agave ovatifolia, which has sadly begun to bloom. 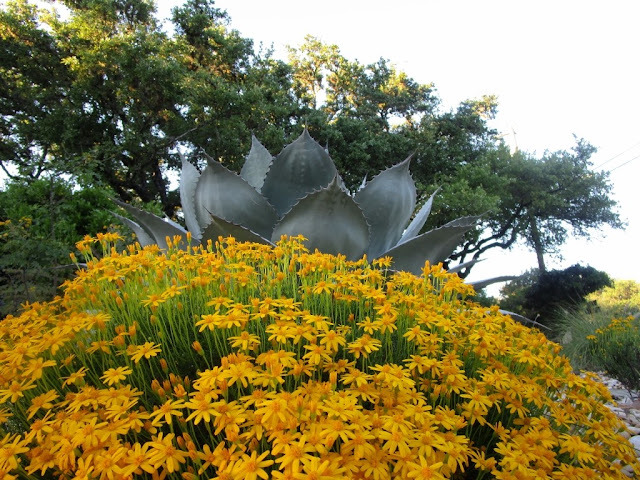 Agaves bloom just once and die. 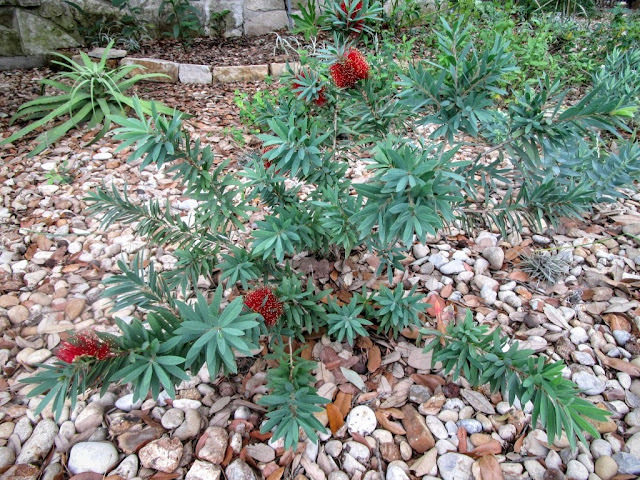 Following Pam's "Moby" posts on her blog Digging inspired my own interest in adding one to my garden. You can follow Moby's bloom daily on Pam's Facebook page or see her post at Digging. So here's to Moby going out in a spectacular way. While most information on Agave ovatifolia states that it does not offset, I was surprised to find an offset in the nursery pot back in 2010 when I planted mine. We carefully separated and nurtured that precious pup for five years before planting it out in the front gravel garden last year. Now about six years old, it's to the left of the large white stone as a "spare" against the day when mine goes the way of all Agaves. 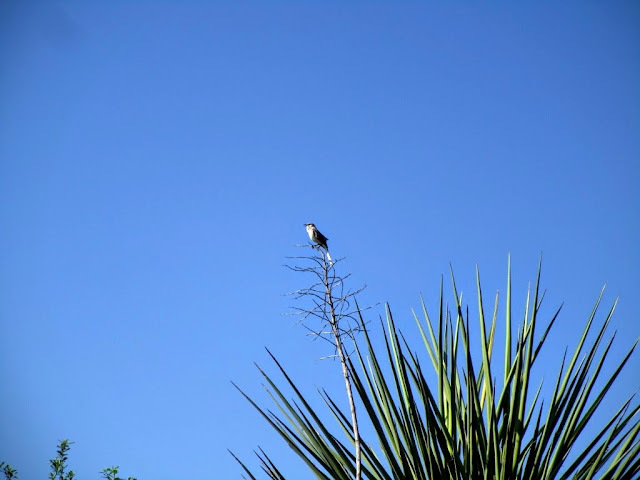 Look closely to see our neighbor's Agave americana is sending up an enormous bloom stalk. Now we'll step back a bit to take the long view from the street where we usually begin our tours. Moving across the front for a different view. I think I should add a few Damianita to repeat the color across the landscape. Yucca rupicola bloom stalk has emerged and is beginning to set blooms. 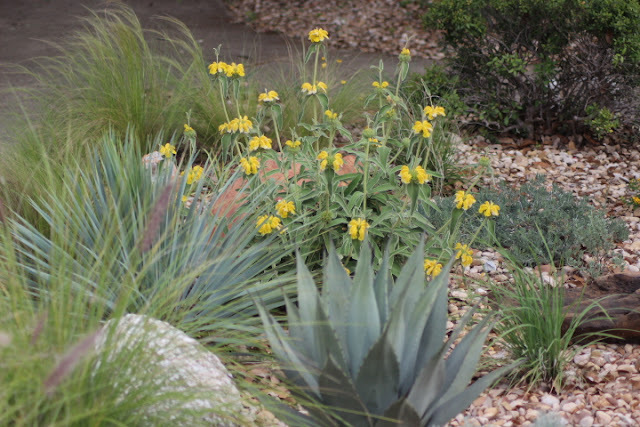 Jerusalem Sage in the island bed is producing multiple blooms for the first time. Planted three years ago it seemed to take forever to grow into a mature plant. It's sure to become a favorite since it needs zero attention to look like this most of the summer. Yucca 'Color Guard' pups have replaced larger ones which died over the winter. I'll have more on that story in another post. Opuntia 'Santa Rita' blooms bright yellow against that gorgeous purple hue. 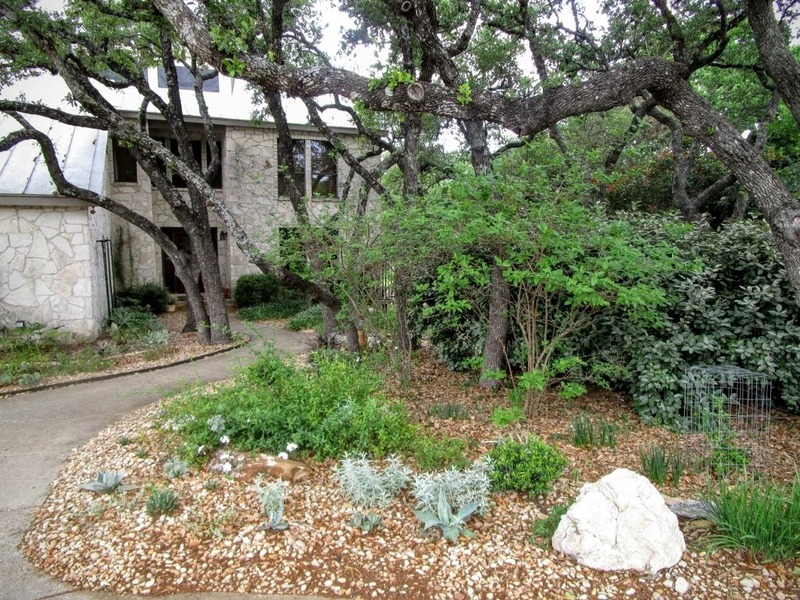 The shady front garden functions as a courtyard walled in by silvery shrubbery. Not many flowers here by design though there is a Canna blooming. I've begun to bring out non-hardy plants in pots for summer display. 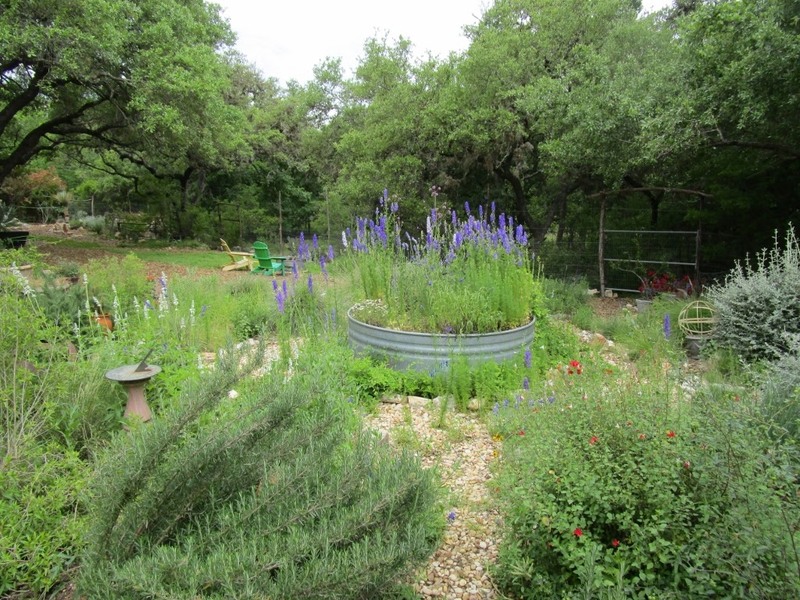 The tank garden filled with Larkspur blooms. The crevice/gravel garden fills with yellow Greenthread flowers each spring. 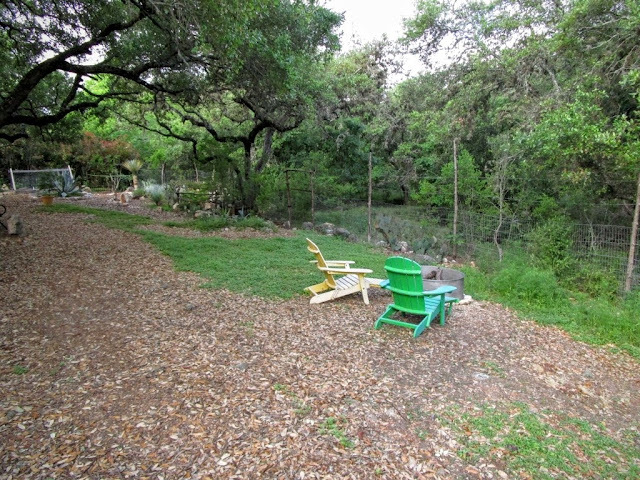 We've added a firepit in the only space with no tree canopy. 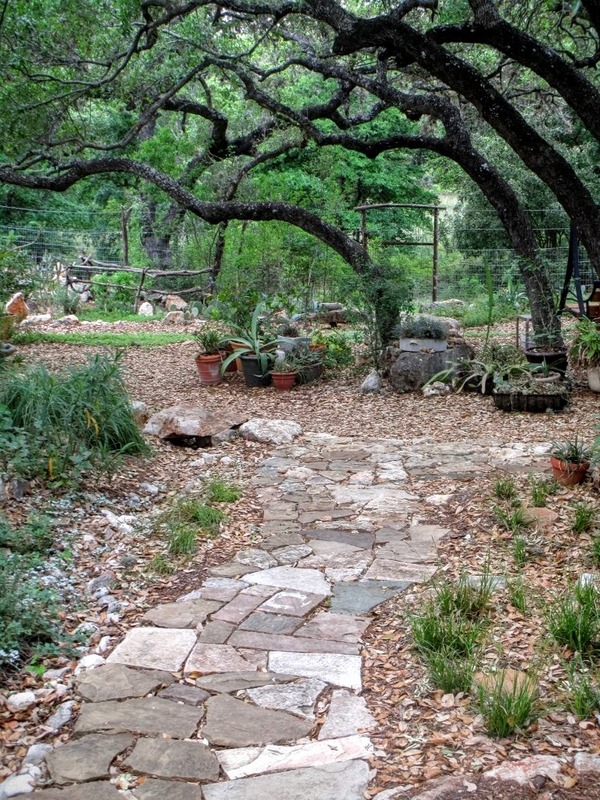 Rock-lined paths lead through a cactus garden in the sunniest part of the yard. One of the new yuccas looks stressed but it's fine. Some of the leaves were damaged in transporting and planting so they've turned brown and we'll cut those off as new ones grow in. 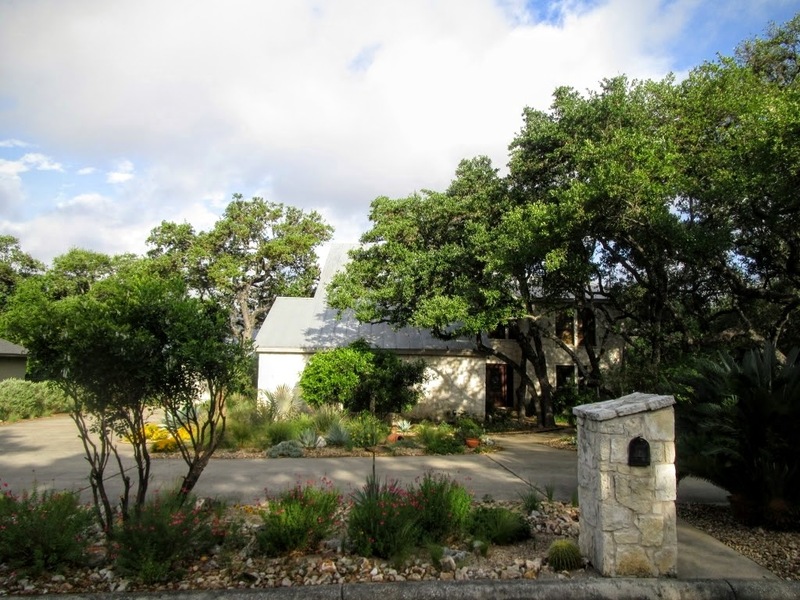 Looking through the gate on the south side of the house with those arching trees. Sedge on both sides of the path beginning to fill in nicely. 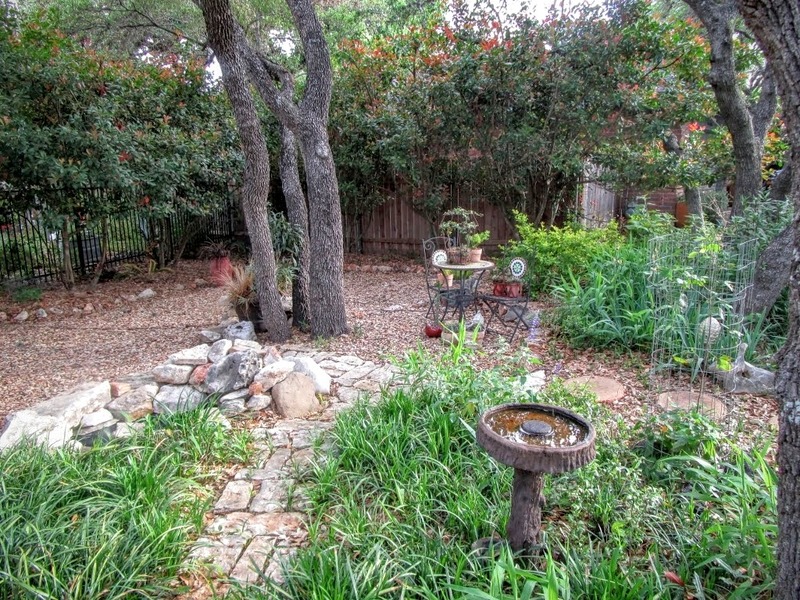 I would tidy up the pot ghetto before a tour and clean out the dry creek which requires lifting all the rocks and raking out accumulated leaf litter. That's the tour for April and it's good to see our hard work paying off now in our 6th year of gardening here. 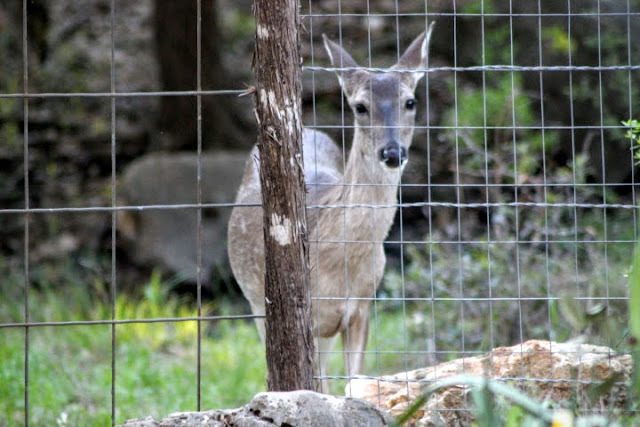 Wildlife Wednesday sponsored by Tina at "My Gardener Says...." provides an opportunity to review wildlife garden visitors from the past few weeks. 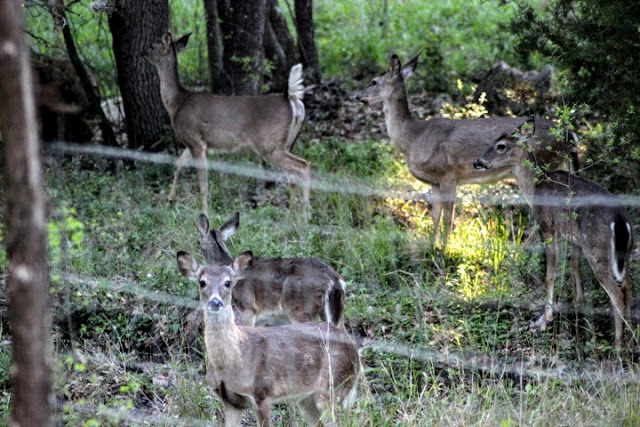 The first Wednesday of each month reminds me it's time to survey photos for wildlife to share on today's Wildlife Wednesday post. 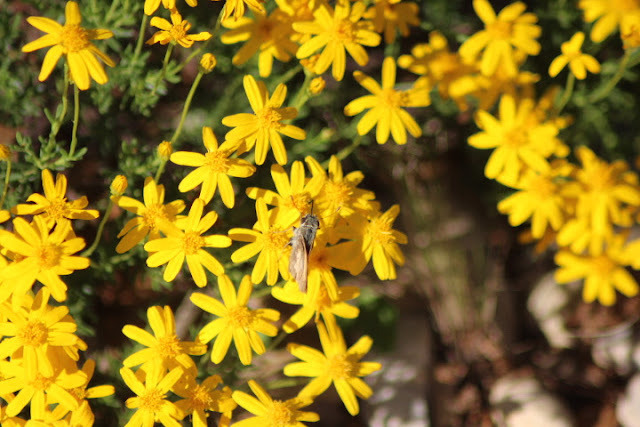 Blooming Damianita attracts more than admiring comments from human visitors. 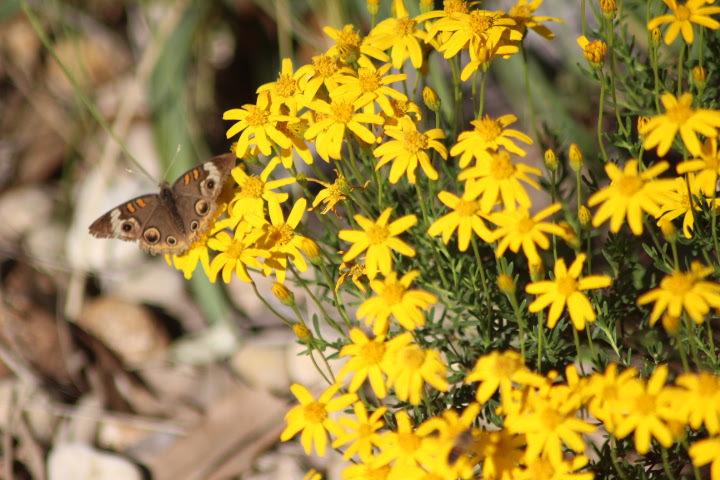 A Common Buckeye butterfly has been enjoying nectar. When closed they are nearly invisible except when Damianita's bright yellow is the background. 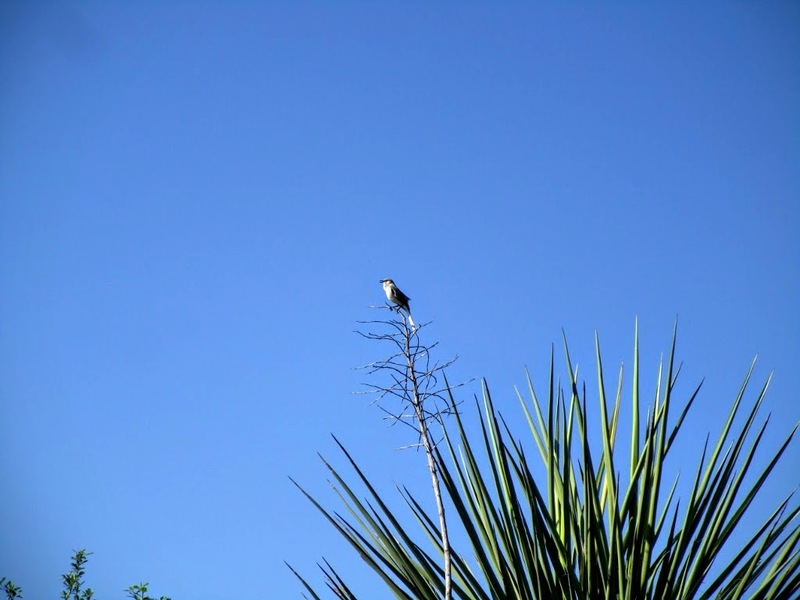 Mexican Bird of Paradise also has its share of visitors like this solitary bee. 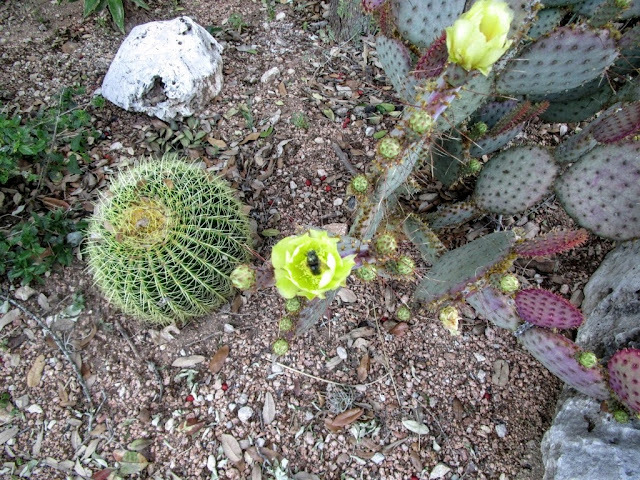 Another bee insists on posing in the yellow Opuntia 'Santa Rita' flowers. 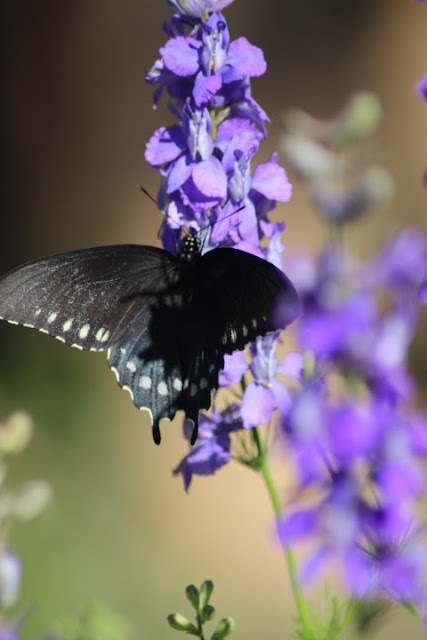 Buttlerflies this month include Giant Swallowtail on Gomprena 'Fireworks' which attracts a surprising number of butterflies considering it's not a native plant. Just love the combination of colors. 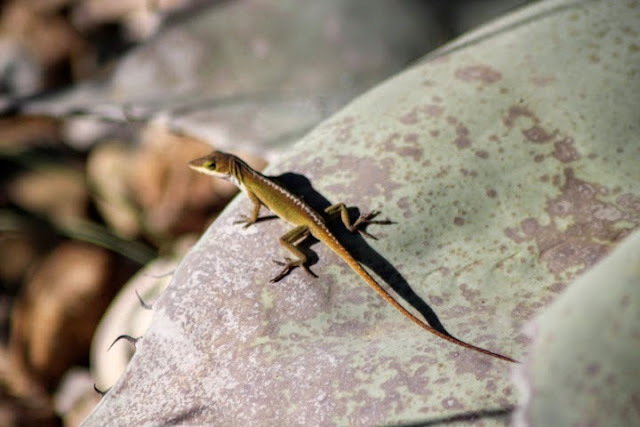 An Anole has claimed the Agave ovatifolia. 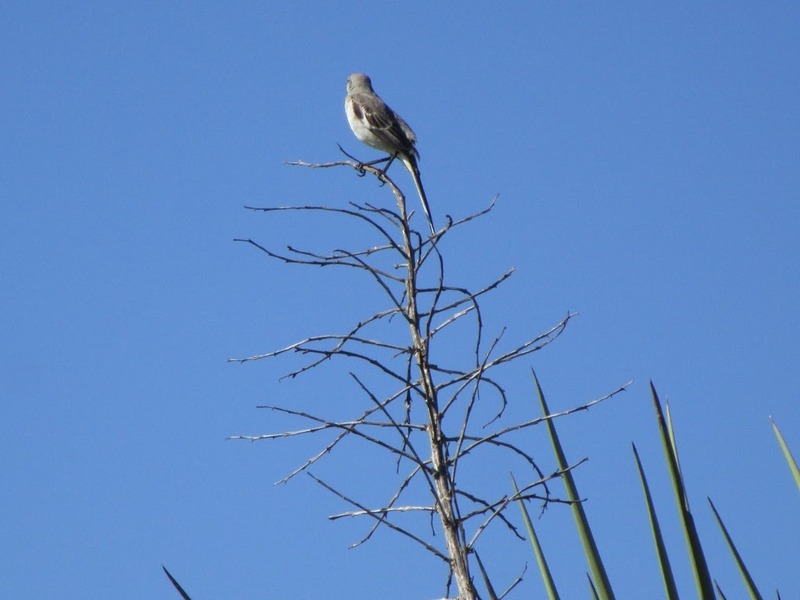 A Mockingbird serenaded me as I parked my car near the Warrior Family Support Center where I volunteer each week. Usually they will turn to ham it up for the camera but this one was playing shy. Guess she likes the new swing as much as we do. Take a picture next time! Come back and bring the whole family! We haven't seen fawns yet but they should begin arriving soon. Not that we need more deer. 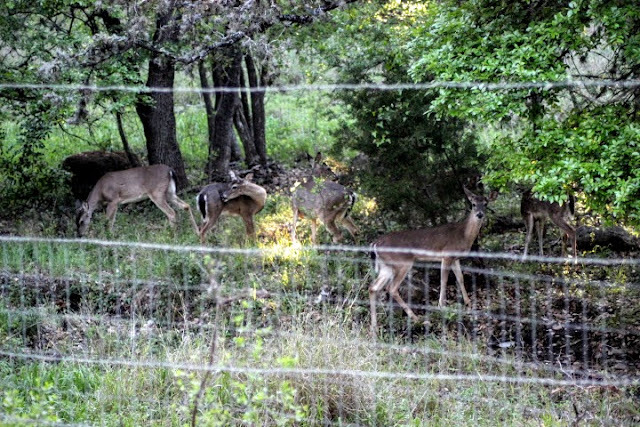 The herd is getting quite large again. 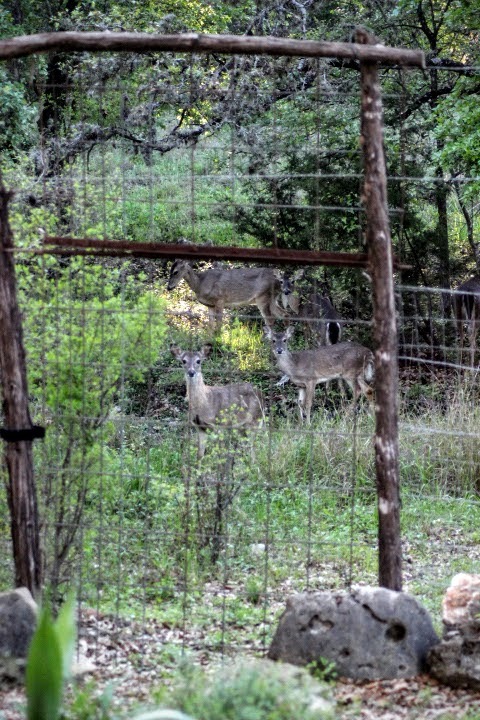 For more on wildlife from blogger's gardens head on over to "My Gardener Says..." and check out the comments section for links. 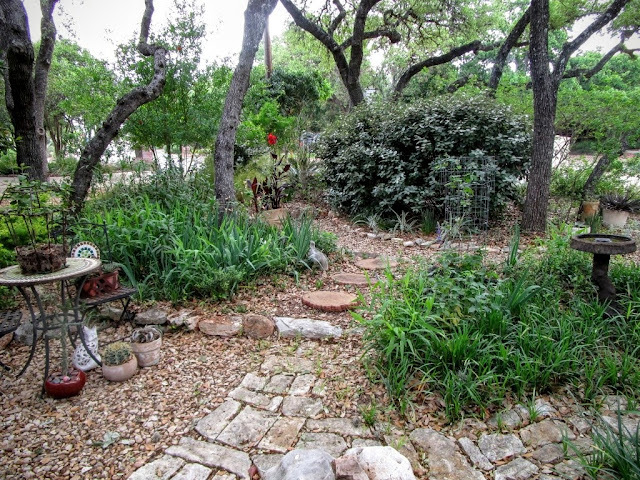 Spring Gardening Events in San Antonio! 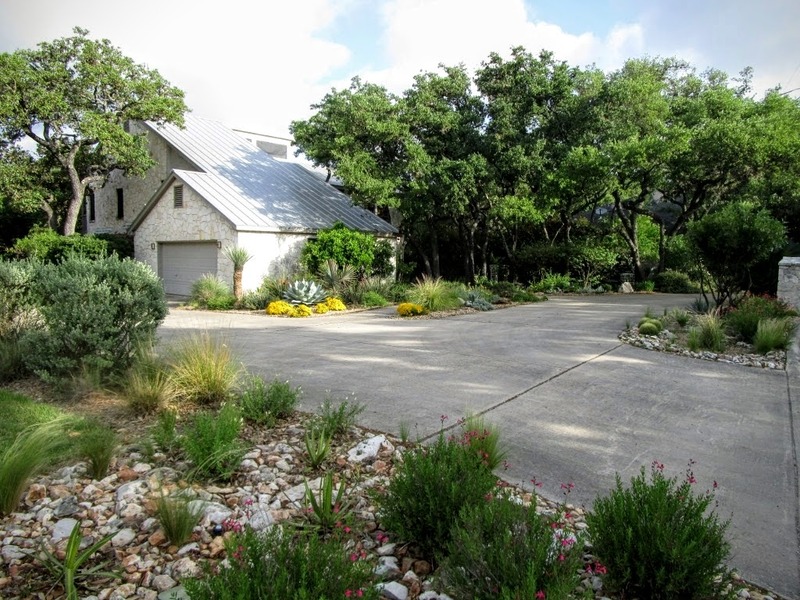 Next Saturday, April 9, is the annual Watersaver Landscape Tour. Usually held in the fall, the tour was postponed due to rain. 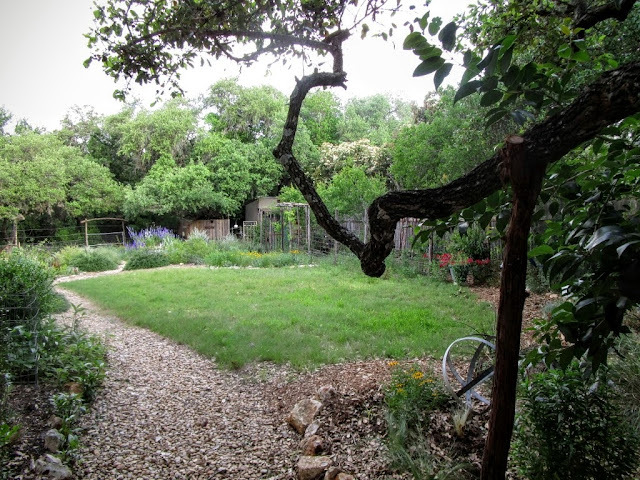 Last fall I visited The Mozersky's serene courtyard garden where I will be a volunteer docent from 9 am to noon. 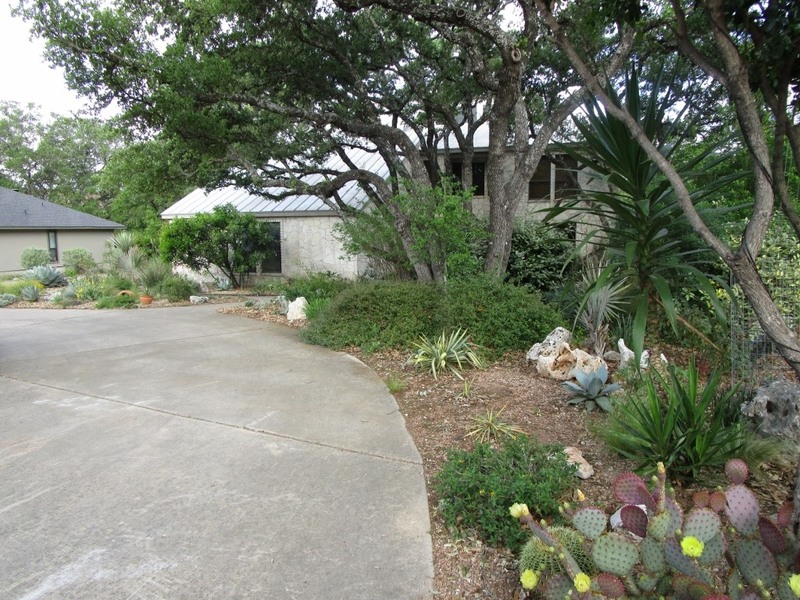 It was also featured recently on Central Texas Gardener. 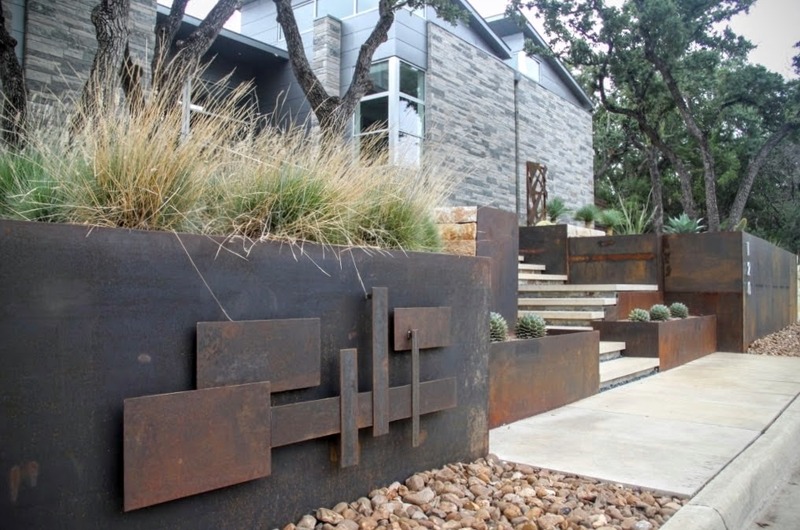 The Bhatia's stunning modern garden is one I look forward to seeing again. 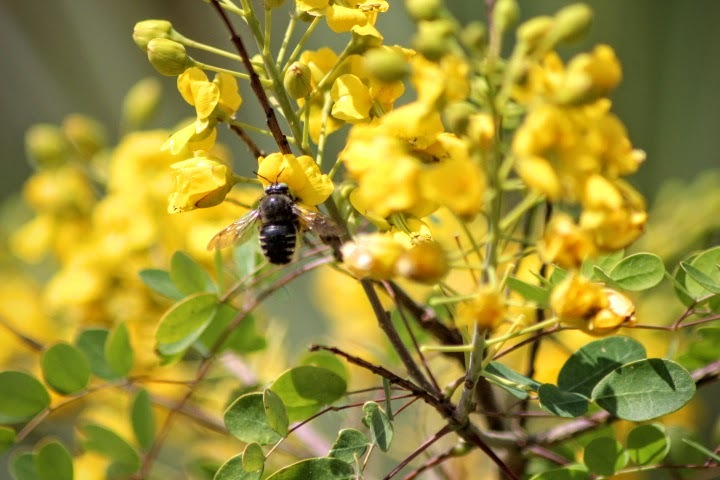 This year's spring tour timing gives tour goers an opportunity for a different view of local gardens than normally seen in the fall. The gardens on tour are all located in the gated community of Inverness and a shuttle is provided at the Barshop Jewish Community Center on NW Military Hwy. To ensure you get on the shuttle when you arrive, you can sign up for a time here. Gardening Volunteers of South Texas (GVST) will have volunteer experts on hand to answer your gardening questions while you wait for the shuttle. You can also learn about GVST's Watersaver Landscape Design School scheduled for April 30th at Phil Hardberger Park. 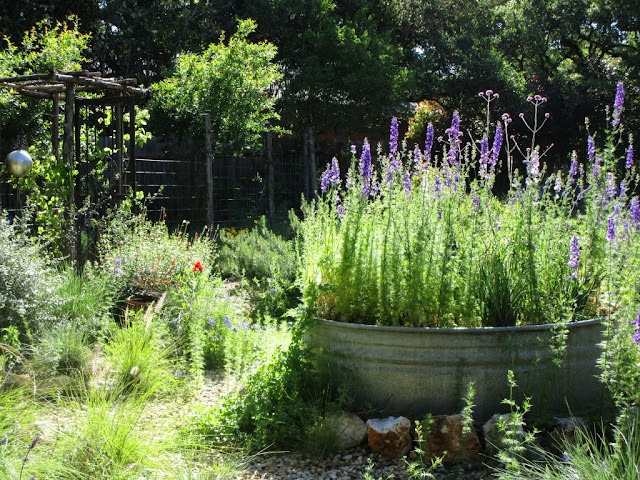 The half-day school teaches you the basics of watersaving landscape design. The program includes a one-on-one design consultation where experts will answer your garden design questions. 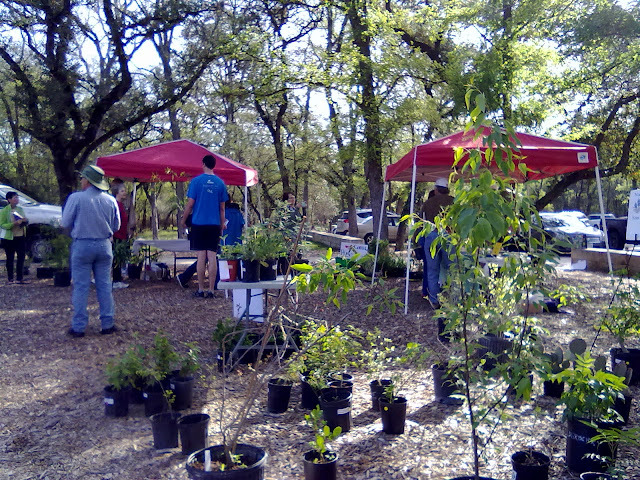 Also on April 9th and just around the corner from the tour, The Native Plant Society of Texas San Antonio Chapter will be holding a plant sale at Phil Hardberger Park. The park is very close to the garden tour staging area so I'd recommend stopping by the plant sale early and then heading over to the tour. 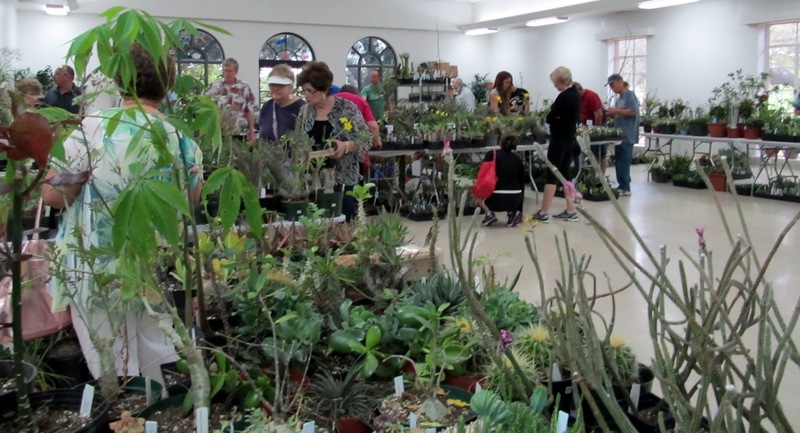 April 21-23, the San Antonio Cactus and Xerophyte Society will hold their annual show and sale at the San Antonio Garden Center just across the parking lot from the San Antonio Botanical Garden. It's a great opportunity to see many varieties of low water plants in one location and pick up an interesting plant or two for your own garden. I try to arrive early on Thursday for best selection. 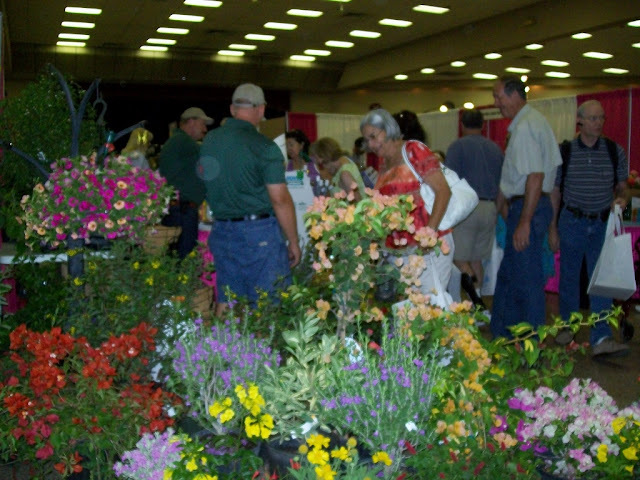 May 28th brings the annual Festival of Flowers at the Shrine Auditorium on Loop 1604. In between gardening seminars you can shop the vendor floor for plants and garden-related items. The city-wide plant exchange sponsored by GVST is a great place to exchange your extra plants for ones you'd like to have. Pam Penick is scheduled to speak at this event about her new book The Watersaving Garden: How to Grow a Gorgeous Garden on a Lot Less Water. Pam will have copies of her book available for sale and will sign them for you at the author's table (usually near the entrance.) You can read my review of the book here. I typically volunteer in the afternoons at the GVST information booth answering questions about GVST and the Watersaver Landscape School mentioned above. Lots of great garden events in the next few months, so I'll see you there!